Its at the bottem of the picture on the right side of the table. In this photo of Kygo, in what looks to be his home studio, the keyboard directly to his left is the Novation UltraNova synthesizer. He posted this photo to his [Facebook page](https://www.facebook.com/kygoofficial) June 23, 2014. 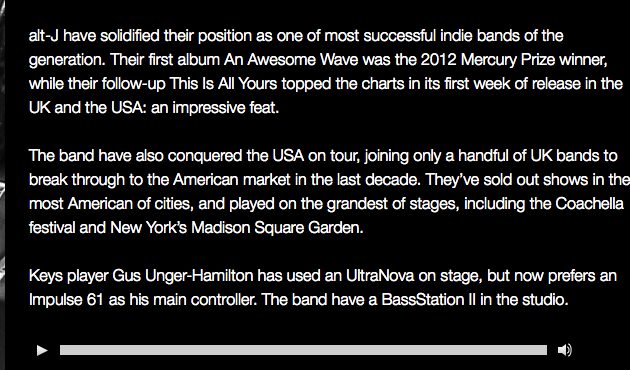 On Novation's website, it states that Gus has used a Novation UltraNova. Frank Delgado using the Novation Ultranova. Mounted to wall, seen with Vocoder set up, likely routed to logic. in this photo we can see his ultranova synth..
Free K Dominguez of Kidneythieves seen using a Novation UltraNova Synthesizer in their studio in a picture posted on their official Instagram. Ryo mostly uses the Ultranova for it's vocoder, but he has used it for it's synth presets. see photo - you can tell it's an Ultranova, not a MiniNova, from the shape of the instrument at the back. Kota uses a Novation Ultranova at all of his shows. She this synth stolen from her and posted it on her twitter. In a setup picture from his facebook page. "About to set all this up...."
An UltraNova can be seen in use in this Global Citizen video. The UltraNova is a ‘Nova’ series analogue-modelling synthesizer with a powerful effects processor. It is a single-part synth, taking the Supernova II synth engine as a starting point and updating it. It now includes wavetable synthesis, more powerful filters, a software editor and a new touch-sense performance mode. Great Sound, but DAW connectivity lacking and a bit cumbersome. The sound is great on the UltraNova. Many times when I can't find a plugin sound for the job, the UltraNova manages to fill the space I needed. The main and only problem I have, is getting audio and midi working correctly in Ableton. It does work, but its always a hassle. Something changes and I have to reset it up all again, or it breaks the connection inside the daw for some reason. Right now I'm having USB powering issues, so I have to use an adapter to get the keyboard working. Other then that I like it for its capabilities. Many people rag on VA synths saying they sound to sterile or digital. This little beauty is far from that. Nice warm sound, tons of modulation capabilities. Great for pads, stabs, hits, and almost any ambient type sound you want to get. It's really got no Ear Grabbing Sounds. The Arpeggiator is average and it doesn't last much Hardware wise but It's an Okay Synth. At least for a start. My friend, also a producer, uses one in his home studio. Presets sounds good, it seems to be a capable synth for every style of electronic music. The DAW integration software just does not work properly when you want it. I had to just run it in as audio and record midi that way over the plugin. If you want a synth that is capable of meeting your expectations then this is the synth for you. I've been using this since my Bloodline EP and for a lot of live gigs. It's a wonderful synth. If you're wanting to ambient, dubstep, or some jazz. Then the Novation Ultranova can do it. I love it because of how easy it is to use and it's never ending sound bank. I never knew any artist that used this until after I bought it. This thing sits on my desk as my secondary controller.. i say secondary because i call my Motif my main, but since the motif is under my desk and this one sits on top, this is my go-to controller when browsing sounds from my DAW. I love the internal synth and really dig the fact that it's bus powered. Therefore this is my buddy when i need to make music on the road. fat sound, and great vocoder! It´s a nice Synth but the it´s VST is not the best... get soundcrashes sometimes. I use it frequently besides my Roland FA-06 as an universal source for lead and VA sounds. Its lightweight, portable, easy to use and has full size keys! 4 x 127 sounds, which can be searched by category/style. Plenty of front panel controls. Stylish and modern design - looks nice on stage, I can recommend to any active performer. Love this beast! Vocoder is right on and key bed is excellent. To be honest the only reason this product isn't 5 stars is I've found it incredibly hard to integrate with any DAW I've wanted to use it for. I haven't had much trouble setting it up as a MIDI controller, but in terms of accessing the Ultranova's power and software into a DAW, it's been unattainable for me so far. I know there's a way to do it through an Ultranova Editor VST in your DAW, but the plugin is very hard to get working on it's own, much less with the Ultranova. Besides all this, working with the standalone Ultranova has been incredible. It simply has everything and sounds great. In fact, every time I look for motivation and inspiration, my steps are to 1) take a break and listen to music, and 2) play around on the Ultraova. Incredible, interesting sounds are very attainable and in my early years I even found intrigue in simply turning parameters mindlessly. Make very powerful leads, pads, and especially basslines in minutes just by toying with it. A great synth. It doesn't produce very professional-sounding tones. They sound kind of cheap and plasticky like a little kid's toy. I have found a few slightly better patches online. Love the controls but the tones aren't that great.